Short on time? Let flashlights sellers contact you. 9pcs LED Flashlight Torch with Aluminum Housing, Operated by 3 x AAA Batteries. 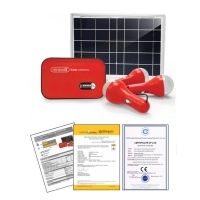 Baoding Victory Traffic Facilities Co.
Name: Solar Flashlight Model No. : TS-1 Brief Introduction: Solar powered flashlight is a new Pv-tech application products developed and produced by our company, we have proprietary intellectual property rights on this product and already win the national new patent (patent number: ZL 2008 2 0076091.7). Parameter Solar power panel: polycrystalline silicon, length: 122mm, width: 22mm, output current is 55mA, output voltage is 6v. Rechargeable battery is inside: Environmental protection nichrome battery 3,1.2v 600Mah. Light source: One ultra-bright LED. Lighting-up time: Make the solar power panel oriented to the sun, after effective sunshine reaching 8 hours, the solar powered flashlight can last 3-5 hours. Specifications: Length 198mm, head diameter 39.6mm, coda diameter28.6mm. Air bubble bag + color box packing, Dimension of box: 40mm*40mm*200mm Gross/net weight: 215/200g. 1: LED Chipset: Luminus SST-50; Color temperature: 6800K-8000K, life time: more than 50000-100000 hours. 2: Voltage: DC 5.5-12V, Max: 15V, double Li-battery protect; Current: LED whole course constant 5A, voltage step-down circuit input about 2-3Ah. Theoretical luminance: 1000-1200Lm for 1 hour; Dimming function: 100%-80%-50%-30%-10%-Strobe, total 6 grades; Circuit function: low-voltage protection and high efficiency DC-DC, circuit will cut down power automatic when voltage of battery is low enough in order to protect life time of battery. Use DC-DC step-down constant circuit and efficiency is more than 85%. 3: Extreme Range: 600M 4: Aerospace aluminum alloy and hard anodized body, made by exact CNC lathe, Military level hard anodic oxidation, wear-resisting and durable, radiance color and not fades in color. 5: Whole high definition toughened glass lens. 6: High definition vacuum coating aluminum alloy reflect light cup ( orange peel surface or glaze surface ). 7: IP level: IPX-8. 8: Battery: 2 x 18650 (2200mAh) Lithium Battery or 4 x CR123 Li-Battery. 9: Battery Charge: take out of battery and then charge. 10: Switch: click-type tailcap switch 11: Pro-environment silica gel deflating cap (Black or Green color). 12: Weight: 307.3g (exclude battery). 13: Widely usage: Police, traffic, fire-fight, water project, forestry, outdoor, explore, trip and so on. This model can headstand, also matches with fixture, and not become hot for long time running. Soft-press or power off 1-2 seconds for changing grade, not changing grade within 3 seconds power off. Export carton / colour box. Shenzhen Longshengwangguang Electronics Co., Ltd. LED is high bright with life time of 50000hours. Body stainless steel and High grade plastic. Slide switch is tested for long lasting. 50 Pcs master packing. JY-7200 Orthodox JY-SUPER Rechargeable Flashlight Battery:4.0V/0.6AH sealed rechargeable battery Blister packing carton size:58*52*38cm LED:5pcs Duration Time: APPROX 12 hours. 120pcs /ctn. Longxing Optoelectronic Technology Co., Ltd.
1: LED Chipset: Luminus SST-50; Color temperature: 6800K-8000K, life time: more than 50000-100000 hours. 2: Voltage: DC 5.5-12V, Max: 15V, double Li-battery protect; Current: LED whole course constant 5A, voltage step-down circuit input about 2-3Ah. Theoretical luminance: 1000-1200Lm for 1 hour; Dimming function: 100%-80%-50%-30%-10%-explode flash, total 6 grades; Circuit function: low-voltage protection and high efficiency DC-DC, circuit will cut down power automatic when voltage of battery is low enough in order to protect life time of battery. Use DC-DC step-down constant circuit and efficiency is more than 85%. 3: Extreme Range: 600M 4: Aerospace aluminum alloy and hard anodized body, made by exact CNC lathe, Military level hard anodic oxidation, wear-resisting and durable, radiance color and not fades in color. 5: Whole high definition toughened glass lens. 6: High definition vacuum coating aluminum alloy reflect light cup ( orange peel surface or glaze surface ). 7: IP level: IPX-8. 8: Battery: 2 x 18650 (2200mAh) Lithium Battery or 4 x CR123 Li-Battery. 9: Battery Charge: take out of battery and then charge. 10: Switch: click-type tailcap switch 11: Pro-environment silica gel deflating cap (Black or Green color). 12: Weight: 307.3g (exclude battery). 13: Widely usage: Police, traffic, fire-fight, water project, forestry, outdoor, explore, trip and so on. Export carton. Dongguan kyode electronics ltd. Is a manufacturer for led items such as rechargeable led flashlight, led torch with fm radio, big power emergency lanterní¡etc. 7+5led MULTI-FUNCTION EMERGENCY LIGHTNIG-LAMPS 3x1.5v"AA"size batteries High-Brightness LED lights, remote irradiation up to 40 meters LED service life of 100,000 hours, no replacement for life Energy-saving, electricity-saving, lit up for more than 16 hours Small in size, folding, multi-functional, and easy to carry, can be used for living and working lighting ect. 5	Size	ª+Outside Diameter mm	63mm long	mm	123mm. tactical flashlight,rechargeable flashlight,portable flashlight CREE Q3 LED,which is brighter than the standard led 1.cree led flashlight,super bright flashlight,rechargeable flashlight 2.Circuilt Dc-Dc Broad-range constant current 3.low power consumption,the LED usable lifespan is more than 100,000 hours 4.powered by the 18650 battery (included) 5.on/off button at the back 6.with the black strap,you can take along it anywhere easily 7.CE Approved 8.gift packing 9.suitable for indoor and outdoor using 10.attention:don't watch directly in the LED ,which can damage your eyes Model:GL-K05 Product size:300x51x36mm Weight:320.5g. Tactical flashlights t1.0 is specially made for hunting, military action, search and rescue, law enforcement, self-defense, operation under water and in the night, and other bad conditions. The shell adopts aerospace -grade aluminum alloy, and machined by precise cnc. The surface is hard anodized finish, and conforms to military-grade type. Gift box.